It has been months since my last confession, I mean blog post. Things have been so busy around here that I’ve barely had a chance to bake, not to mention blogging about baking. But, my stomach has been keeping me home sick so what better time to catch up on the blog? Forgive me for my lateness and enjoy the recipe! This recipe is by the Barefoot Contessa and is in the December, 2010 Food Network magazine. While it’s actually super easy, you do NEED a candy thermometer or know how to test for firm ball in cold water (I’m not a pro at this so we got a candy thermometer). The first batch I made was too soft because we didn’t have a thermometer to test the temp-let me tell you, it was not fun to deal with! After we got the thermometer I did it again with perfect results. Instead of sal de fleur (good luck finding this at your local grocery store!) I used 2 tsp kosher salt. 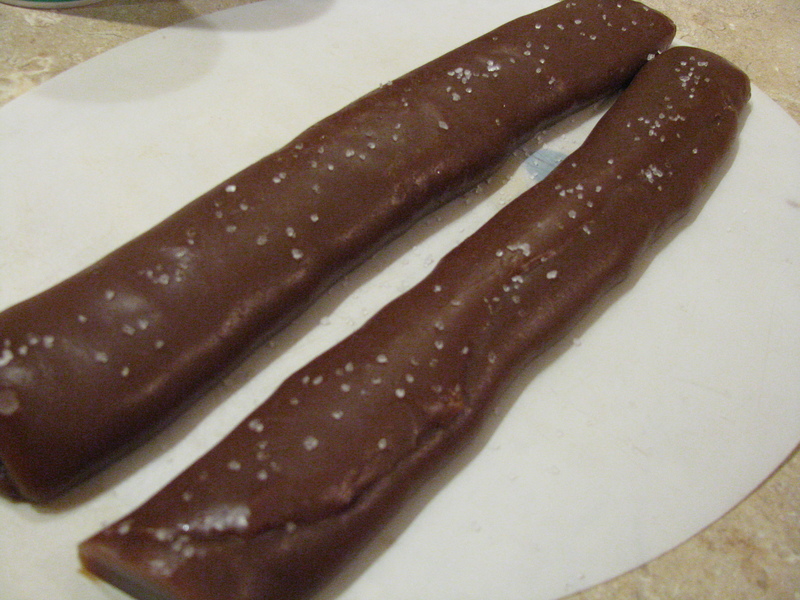 For decorating I used course ground sea salt-it added a nice crunch and the desired saltiness to the outside of the caramel. Prepare a pan: use an 8″x8″ casserole dish. Line it with parchment paper (don’t substitute parchment paper with wax paper–trust me. Seriously, trust me.) leaving some paper hanging over two edges, and brush the paper lightly with vegetable oil. Set aside. First, put water, sugar, and corn syrup in a saucepan (a good sized one-BC calls for one 6″ across and about 4.5″ deep). Bring it to a boil over medium-high heat. In the meantime pour heavy cream, butter and 2 tsp salt into a small saucepan and bring to a boil over medium heat. Once the milk mixture boils turn off heat and set aside. Watch your sugar as it boils. Once it reaches a “warm golden brown” remove it from the heat and CAREFULLY!!! pour in milk (it boils up like nobody’s business!). I stirred after pouring in the milk and then put it on the burner under medium low heat. Let the whole mixture simmer until it reaches firm ball or 248 on a candy thermometer. Then pour it in your prepared pan. Stick it in the refrigerator for about 3 hours, or until the caramel is completely cooled and set. Once the caramel is cooled lift it out of the pan use the overhanging parchment paper. Place it on the counter. Cut the caramel square in half. Take one half of the caramel and roll it into a log (BC does it a little differently, but this is what worked for me). Once you have a log about 1 – 1.5 inches in diameter start cutting it into pieces. 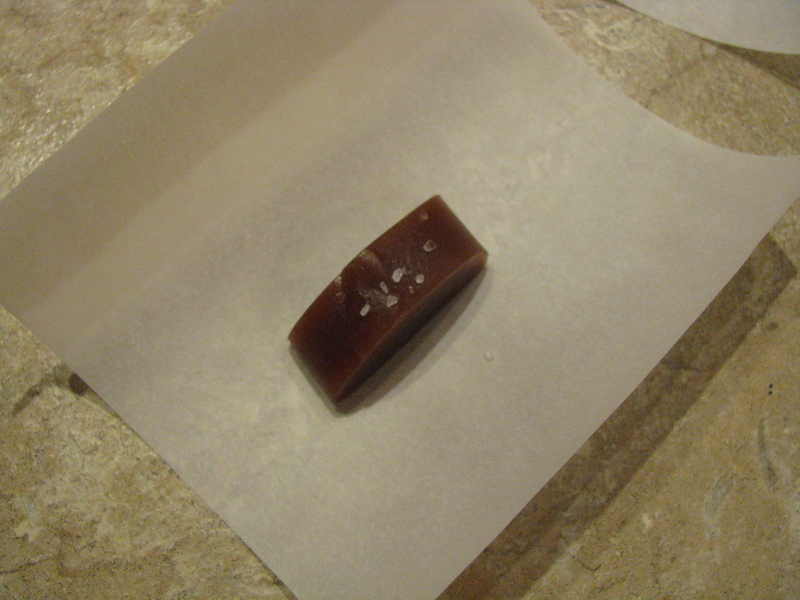 Now cut pieces of parchment paper (about 3in X 3in) and place caramels on the papers and sprinkle sea salt on top. 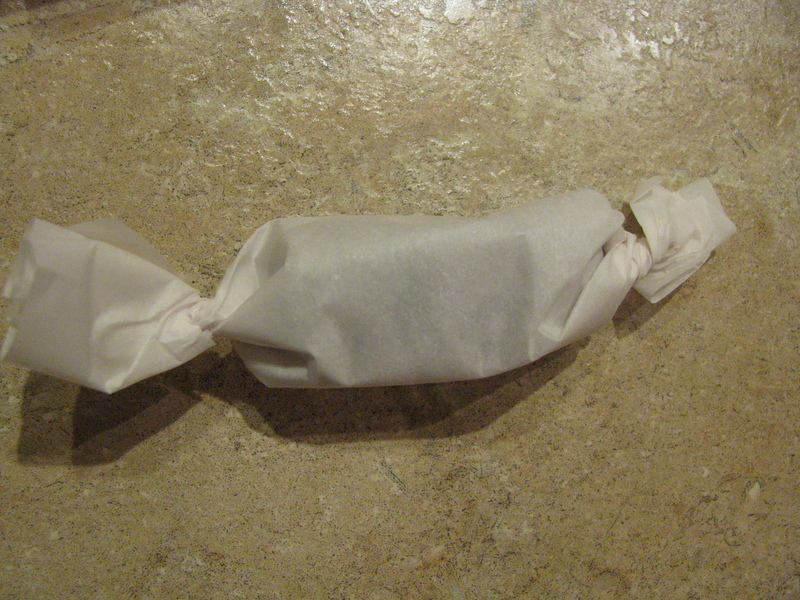 Roll the paper around the caramel and twist the ends to secure. Ta da! 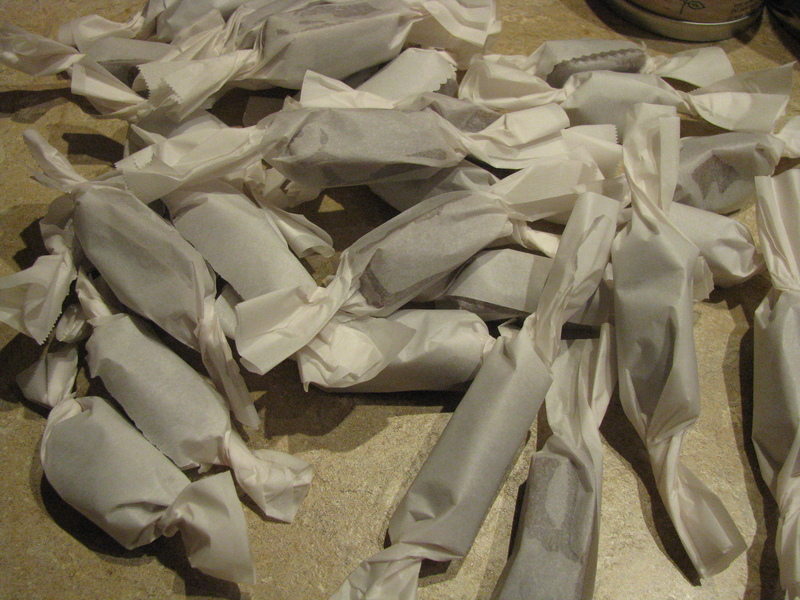 The number of caramels you end up with depends on how small you make your caramels. 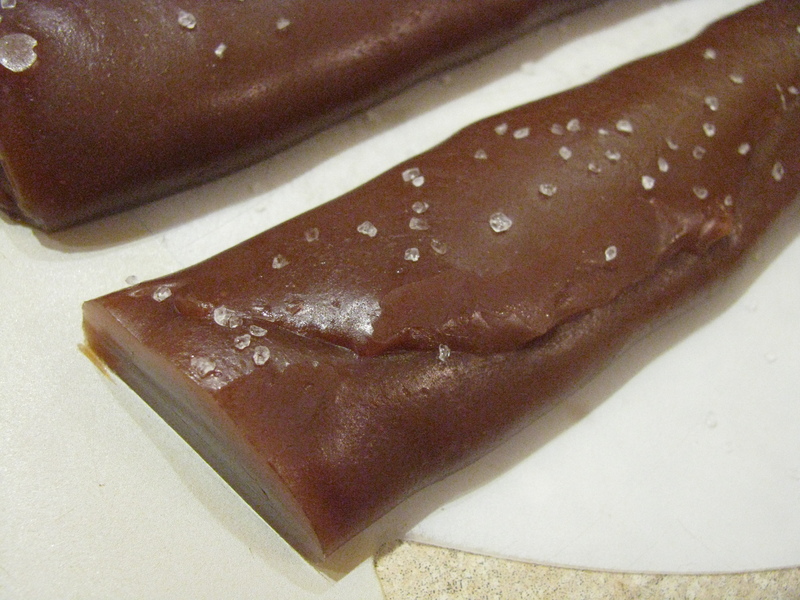 If you want more, but smaller caramels just roll your log out longer. One of my caramel batches was a little harder than the other. Therefore, I couldn’t really roll it into anything. I just cut it into squares and wrapped the squares up . The caramels were just as yummy-you just had to hold them in your mouth a few seconds longer before chewing (oh, darn!). Hope you give this one a try-could be a great Mother’s Day treat! Categories: Baking, Delectable Dabbling, Food, Sweets | Tags: candy, caramel, homemade gifts | Permalink.